The classic drum lampshade with simple cylindrical design and straight lines is a great choice for the modern home. 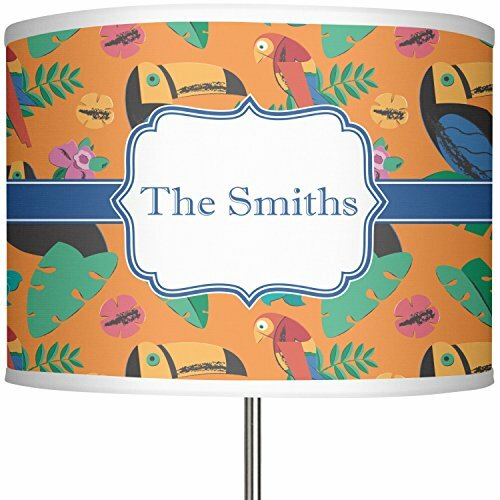 Our drum lampshades will work well in the bedroom, living room, hallway table or even in an office as a desk lamp. Our drum lampshades are available in 2 different materials - polyester or linen and measure 13" in Diameter and are 9.25" tall. This polyester version is the more affordable of the two, while still maintaining a simple elegance. We have created many different designs for you to use as a starting point. We add personalization on most of our products - but the choice to keep or remove your name or monogram a product is yours. You can customize one of our designs by changing the pattern, the colors, the label & ribbons to suit your individual needs. Or you can design your own lampshade using our customization system. If you have something specific in mind and need help designing it, contact us and we will do our best to accommodate your needs. * Lamp Base is sold separately. Lamp Base is sold separately.